The Angels trilogy just received a facelift! I found a great new graphic artist, Deanna Dionne, who made a few tweaks to the covers in the way of an accent color and new fonts. I also made some edits to the books. With Nikki now finished, I took the opportunity to go back through Fallon and Blane to ensure consistency with the plot, and the process allowed me to make edits and add foreshadowing that didn't exist before. I'm excited about the changes because I know that they will enhance the trilogy as a whole. So, if you already have digital copies of Books 1 & 2, make sure you retrieve the updates for your e-reader. (Fallon has already been uploaded and Blane will be uploaded by Tuesday.) And, let me know what you think of the new covers! I would love to hear your thoughts. Hello folks! Just wanted to pop in and give you an update. If all goes well, Nikki should be finished within the next two weeks. Then starts the editing phase which usually lasts around four to six weeks. Expect a published book by early to mid February. I will be announcing some giveaways around the first of the year to gear up for the release. After that? My spring will be consumed with finishing Island Shifters Four. Very excited about that. Thank you so very much for reading my words. It's appreciated more than you know. I leave you with the quote of the day. This one by Kade. In this scene, Blane races up to Fallon and Kade preparing to fight a Black Knight from Mordeaux. Blane got out of the car and sprinted toward Fallon and Kade. Blood dripped from Kade's face, but he had somehow managed to find a metal rod that he hefted back and forth in his hands, apparently gauging its damage potential. "Where’s Joseph?” Blane screamed, skidding to a stop. "He’s gone,” Fallon told him. “Tyras” from Angels of the Knights – Nikki. I started this book despising this character, the epitome of all that is evil in the world, but he is proving more complicated than that. A shout out to the incomparable Nick Deligaris for bringing him to life. [Insert hard brake sound effect here]. I had a change of mind that I hope won't upset too many people. But...I'm shelving Island Shifters - An Oath of the King to finish Angels of the Knights - Nikki. Why? Two reasons. First, when last we left off in Book 3 of Island Shifters, everything was buttoned up very tidy. No cliffhangers, no teasers, no cursing or clamoring. Perfect. Just the way I like it. Since Book 4 is going to be the start of a brand new adventure, there is no sense of urgency (at least no one has indicated as such to me). Second, and simply put, more people want Nikki. Issues are unresolved. The fate of a certain character is unknown. It's the last book in a trilogy. Urgency is higher. So, onward with Nikki. I'm really excited to explore her story. I will post an estimated release date within a few weeks when I have a better idea. As always, I welcome any and all comments. For some reason, I have spent more time than usual on knotty, little paragraphs that exist purely to drive me insane. I cut and paste and twist and turn, but sometimes the writing just doesn’t flow exactly right. If I read the chapter back and keep stumbling at the same spot, I know something is off and it prickles at me like a sore tooth. Sort of like a Rubik’s Cube with one column the wrong color. Everything around the offending little horror is lined up perfectly, but that one area draws the eye and makes it, well…not perfect. I have often compared writing to puzzle solving. With both, tiny tidbits of information must be gathered and meshed together to create a beautiful whole. All imperfections stand out and the process is often frustrating and seemingly impossible to solve. But, in order to see the beauty underneath, you keep at it. You analyze and pick and prod until all the pieces fall into place. When they finally do...when all those squares line up, it’s a rush like no other. Not that I’ve ever solved a Rubik’s Cube, mind you. I don’t have the patience for that kind of thing. I prefer the conundrum of constructing Book 4 in a 400,000 word epic fantasy any day. Call me weird or call me a writer. Either fits. I don’t know about you, but summer is slipping through my fingers like melted butter and as a result, I haven't been able to accomplish all of my goals. I had hoped to have An Oath of the Kings 75% complete by now, but I am currently at 25%. Angels of the Knights - Nikki is supposed to be fleshed out and outlined. Nope, not done. Sorry. That said, I promise that I will try to wrestle August into submission and get some work done. More updates soon. Until then, enjoy your summer, stay safe, and keep reading. Island Shifters is going on a Book Blast Tour hosted by Goddess Fish. Stop by the awesome blogs listed below to win a copy of Island Shifters books 2 & 3 and a $25 gift certificate. Airron Falewir, Melania and his manservant, Quincy (yes, the same Quincy that tried to bar Airron from seeing Melania at the end of Book Two) are discussing the fact that King Thorn has been murdered by an alleged Mage. “Out with it, man. What's happened?” Airron asked, planting his feet and crossing his arms at his chest. Melania let out a squeal of disbelief. “Can we believe him?” Melania asked quietly. Angels of the Knights - Blane Now Available! A huge thank you to Blkosiner's Book Blog for hosting an amazing giveaway for Angels of the Knights - Fallon on her YA book blog. Click on the image above for a chance to win a signed copy of Fallon and a $25 gift certificate to Amazon. Good luck! Hello, paranormal fans! 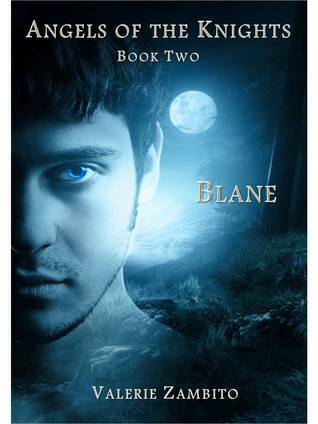 I think it is safe to officially post a release date of 5/31/13 for Blane. Keep watch during the month of April for updates and giveaways! If you would like to be one of the first to review Blane, send me an email at the link at the top of this page. I just received a draft of the cover for Island Shifters - An Oath of the Kings from the talented Nick Deligaris and was blown away. The detail is simply amazing and I can't wait to share it with you. I'm even more excited to start writing this one. The ideas are bouncing around inside my head like out-of-control ping pong balls and I must put fingers to keyboard soon to get relief.